Sky's new 'Buy & Keep' movie purchase service launches | What Hi-Fi? Sky has launched its new service that'll let you download and permanently store films on your Sky+ HD box, while also receiving a physical DVD copy through the post. 'Buy & Keep' won't, however, include Blu-ray titles – but Sky is confident that this is the combination that will meet the needs of the majority of its customers across the UK. Customers who pay to download a movie to their Sky+ HD set-top box will now receive a physical copy of the film on DVD within 3-5 working days through the post. And as we previously reported, the new service also lets you archive old purchases to free up hard-drive space that can then be reinstalled at a later date. There's more than 200 titles currently available including The Hobbit: The Desolation of Smaug, with library titles available for £7.99 and new releases for £13.99. Other movies such as The Wolf of Wall Street and The Secret Life of Walter Mitty will be made available soon, while Sky is also planning further upgrades over the next year. Those improvements include letting you view saved movies on mobile devices. 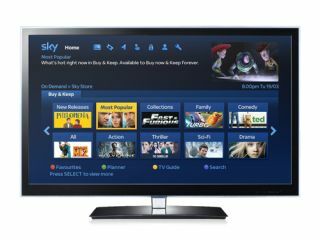 TV box sets will be made available through skystore.com for those who don't have Sky TV.